From coast to coast, the 185,000 members of National Nurses United, pledge our solidarity and strong support for striking members of the Chicago Teachers Union. As a union which represents many nurses in public service, we know the issues that are at the heart of your fight are critical to the public interest. Your strong stance for quality public education at a time when teachers and public education, and all working people, are under assault in so many corners of our nation is an inspiration to all. The whole country, indeed, is watching. In particular, we strongly support your efforts to assure limits on class sizes, which are vital to a quality environment to nurture learning, and your efforts to protect standards to keep experienced teachers in the classroom. Your fight is our fight, for your students, your colleagues, and the future of quality public education. The Chicago Teachers Union is currently on the front lines of a fight to defend public education. On Monday, Sept 10 after months of intense negotiations, the 30,000 teachers of the Chicago Teachers Union went on strike to fight for the excellent education that the children of Chicago deserve. The teachers of CTU have called for a contract that includes fair compensation, meaningful job security for qualified teachers, smaller class sizes and a better school day with Art, Music, World Language and appropriate staffing levels to help our neediest students. On the other side, the Chicago Board of Education hand appointed by Mayor Rahm Emanuel—which is managed by out of town reformers and Broad Foundation hires with little or no Chicago public school experience—has pushed to eliminate pay increases for seniority, evaluate teachers based on student test scores, and slash many other rights. Nurses can support CTU’s strike and struggle for educational justice by donating to CTU Solidarity Fund and submitting a note of support. Make sure to indicate that you’re an RN and mention that you are part of National Nurses United. Can't Donate? Make some calls! Support Chicago Teachers! 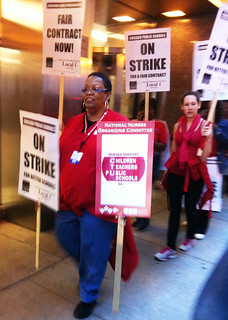 Call the head of Chicago Public Schools and Mayor Rahm Emanuel to support the teachers' demands. Tell them that teachers are fighting for the things that really matter in the classroom, like guaranteed limits to class size. TAKE ACTION! CALL NOW! (they're keeping a tally). Chicago Public Schools CEO J.C. Brizard (773) 553-1500 and Mayor Emanuel (312) 744-3300.